We provide fire protection service, and biometric attendance system with smoke detectors services within kolkata. 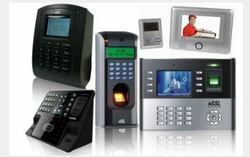 We offer various modern access control systems for limiting access of intruders. It is an ideal way of increasing security of any building or premises. From number lock to fingerprint access control; we provide all. Access control is the mechanism or an ability to permit or deny the use of a particular resource by a particular entity. Access control mechanisms can be used in various methods. These vary from managing physical resources, logical resources or digital resources. Access Control system is one of the most sophisticated and modern system which provides state-of-the-art full-proof security options.